May Hole dance on May Day, ca. 1990. Photograph courtesy of Deb Rowan (Class of 1990). "We Are/We Have Always Been" is a first attempt to uncover the histories of LGBT individuals and communities at Bryn Mawr College between the years 1970 and 2000. The digital project was created during the summer of 2014 by Brenna Levitin (Class of 2016), a Tri-Co Digital Humanities Initiative intern hosted by The Albert M. Greenfield Digital Center for the History of Women's Education. "We Are/We Have Always Been" uses college newspapers, ephemera, photographs, oral histories, and informal interviews to show pieces of a fragmented history that continues to develop in the present day. 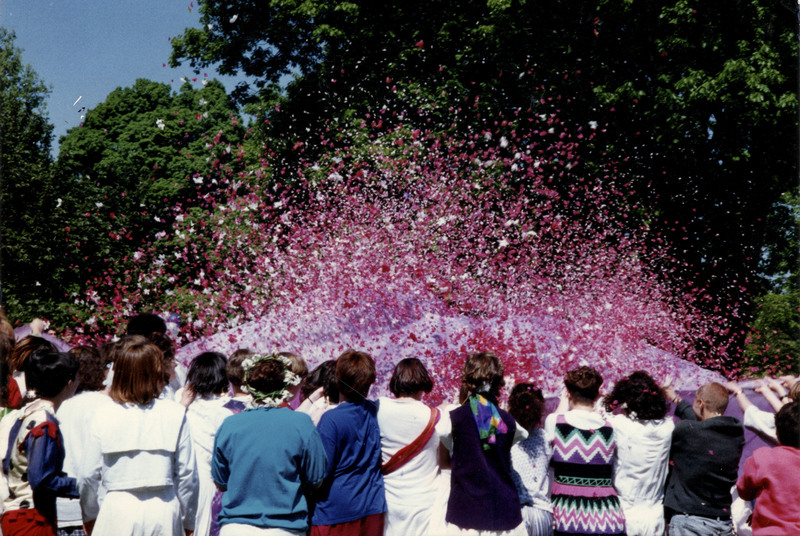 By interweaving the recollections of individuals, accounts of College-wide events and controversies, and the shifting stance of the College's administration towards the LGBT community, the project gives voice to a multitude of personal and shared histories during a period when the status of LGBT groups was shifting both locally and on a national scale. In doing so, it highlights the multi-linear nature of the narratives that make up personal and institutional memory. We also encourage readers to visit "History of Gender Identity and Expression at Bryn Mawr College," created by Pensby Center summer intern Emmett Binkowski (Class of 2016) to recognize Mawrters with diverse gender identities. Along with the digital exhibit "A Point of Difference," recently completed by Alexis De La Rosa (Class of 2015) and Lauren Footman (Class of 2014) to explore histories of students and staff of color, these projects reflect the Greenfield Digital Center’s commitment to research that tackles the diverse and challenging histories of Bryn Mawr College and its many communities.